By Allan Fox: WBC middleweight champion Sergio Martinez (50-2-2, 28 KO’s) isn’t just content with getting a rematch against former WBC middleweight champion Julio Cesar Chavez Jr. (46-1-1, 32 KO’s) next year and proving his win over him on September 15th wasn’t just a fluke thing, Martinez wants to take on Floyd Mayweather Jr. (43-0, 26 KO’s) and show the world that he’s better than the 35-year-old star. Martinez better get in line because Manny Pacquiao could be next up for Mayweather Jr. in 2013 followed closely by WBC junior middleweight champion Saul “Canelo” Alvarez. In addition to those guys, you got to figure that Miguel Cotto figures into the mix as well due to the competitive nature of his fight with Floyd last May as well as the huge pay per view numbers that their fight drew. Martinez, 37, will continue to be a dangerous opponent for Floyd due to Martinez’s size and power. Mayweather is really a welterweight, even though he just finished defeating Cotto for the WBO 154 pound strap. It might be hard on Mayweather to have to deal with Martinez’s hard left hand power shots for 12 rounds continuous. It might also be a problem for Mayweather to have to chase Martinez down, because the movement that Martinez uses might be a problem for Mayweather at this point in his career. At one time, Mayweather was quick on his feet and very mobile. But that’s changed in the last two years to where he now fights flat-footed and uses very little movement. Mayweather might not like having to deal with a fighter with the kind of quick feet that Martinez has. 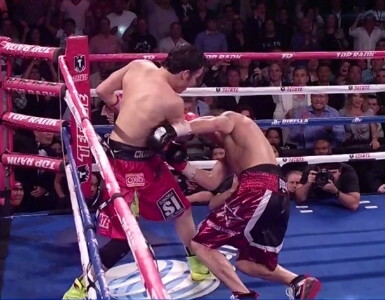 Chavez Jr. had huge problems handling Martinez’s movement and took a beating from him for 11 rounds. I don’t know that Mayweather could take the kind of punishment that the younger, stronger and much heavier 180 pound Chavez Jr. took against Martinez. After all, we’re talking about a cruiserweight that Martinez was fighting and not a guy that comes in barely over 160. Mayweather would have problems absorbing the same kinds of shots that Chavez Jr. did, and Mayweather couldn’t count on blocking or dodging all of Martinez’s big shots. Martinez would land a lot of them. A fight between Martinez and Mayweather doesn’t look likely for next year. I’d give it a slim chance of happening unless the Martinez-Chavez Jr II rematch brings in really huge PPV numbers and a large gate at the Cowboys Stadium in Arlington, Texas. If the Martinez vs. Chavez Jr. rematch brings in huge numbers and Martinez looks vulnerable in winning, then I could see Mayweather possibly showing some interest. But he probably won’t be eager to fight Martinez if the Chavez Jr-Martinez II rematch is one-sided or if it ends with Martinez knocking Chavez Jr. out cold. That might scare Mayweather off for good. Martinez might be better off trying to get someone like Miguel Cotto, Saul Alvarez or Andre Ward to fight him. Those are fights that have an excellent chance of being made, although they obviously wouldn’t bring in the same numbers that a Mayweather-Martinez fight would bring in. « Is the Mayweather – Pacquiao fight any closer?